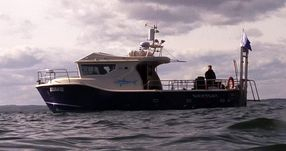 Shadow Marine offers Dive charters from Anstruther in the East Neuk of Fife, Full and half day sea fishing as well as site-seeing tours to the beautiful May island and Bass rock areas. Seals, puffins and cormarants are but a few of the animal life you can expect to see on one of our tours. Hand basin with hot fresh water in the cockpit. - ideal for warming up dive hoods & gloves!